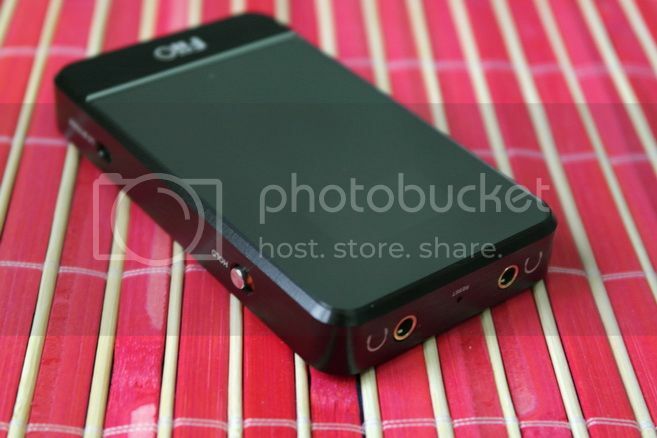 Almost three years ago when E7 was introduced, it was one of only two sub-$100 portable amp / DAC options in the market, and it pretty much out-marketed the competition right away. E7 is originally designed to solve the low sound quality issue related to nettop and netbook due to their miniature size. But with the decline of these tiny PC, E7 becomes lesser relevant and begin to show its shortcoming, especially its lacks on driving power when user are adapting it for other usage beyond just nettop and netbook. E07K is basically FiiO’s answer to bring E7 up-to-date while still maintaining the same low price at $89. Don't worry about the bubble. It is on the protective film that is meant to be removed before installing the screen protector. As with all FiiO products, build quality is pretty good. One of the more obvious improvements from E7 to E07K is the use of new headphone jack. 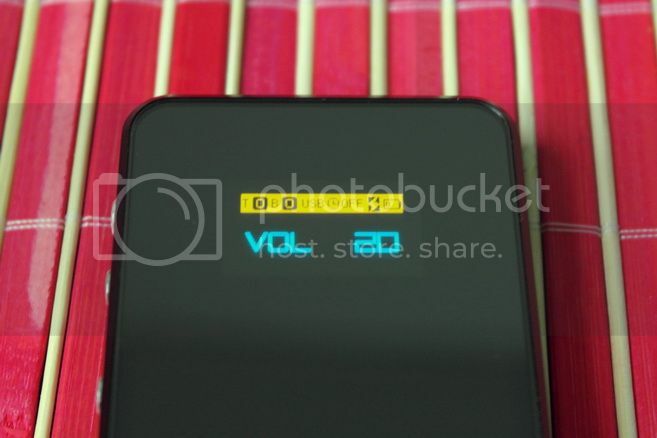 The old headphone jack is considered to be pretty good as well, but occasionally it does fail in too much stress (such using a big 3.5mm plug, like ViaBlue). The new jack is much tighter and hopefully it will take stress better as well. Beyond that, E07K looks as good as the previous E7 and the current E17 as far as build quality is concerned. Accessories wise, you will get a soft pouch, a silicone case, 3.5mm interconnection cable, an USB charging cable, a few sticky rubber feet and two screen protector. 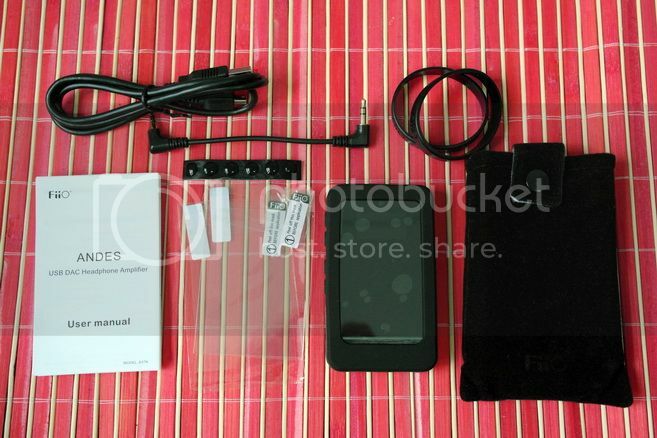 While it is norm for FiiO to include these many accessories, many portable amp rarely comes with half as much things. However, I do have one complain about the screen protectors – they are slightly wider than the screen and therefore you must trim some edges away to make it fits perfectly, or else dust will be collected over the edge. Hopefully this will get corrected in the future batch. Besides having only USB- and AUX-in, plus the fact that all the buttons are located at the side like E7, most of the basic navigation and setting are the same as E17. This is probably because the E07K borrows quite a few of the circuit design over from E17, including the ‘hold’ and ‘LO Bypass’ switches and the volume control / EQ mechanism. Most of them are not hard to understand so I am not going into the detail. The few things I do want to make a note are: Hold key will disable all buttons as well as the screen, so use it to avoid the OLED screen from burning out. You can set the display to auto turn off with a timer as well. LO Bypass lets you switch between outputting fixed line-out sign or pre-amp signal (with EQ effect and volume control) via the FiiO dock connector. You will need either L7 adapter or E09K to get to the signal. If you wish to use E07K as a pre-amp to control volume (or EQ) to another amp or active speaker, do get a L7. Dual headphone-out, same as E7. Battery is claimed over 24 hours, which is a significant reduction over the E7’s 100 hours. But given E07K is much more powerful than E7 and packed more hardware, something have to give. The upside is that 24 hours is still quite long, so you won’t need to charge it every day. 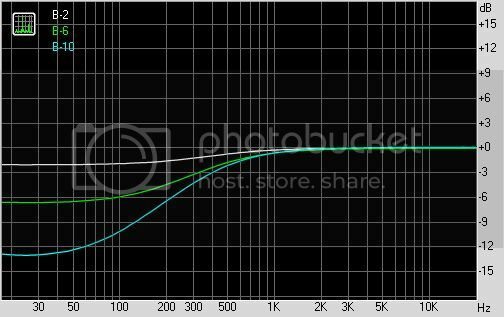 Unlike E7 which fixes at 5dB, E07K can go much higher in gain. However, if you are using a line-level input, I’ll suggest you stick to 0 gain setting, which should give you the cleanest signal. If you find the volume to be not enough, then increase it to the next higher setting. Hiss on E07K is almost as good as E17 as there is minimum to no hiss on zero gain with the hiss prone Shure SE530. With 6dB gain, hiss is only barely audible over 55/60 in volume. With 12dB gain, hiss became noticeable pass 40/60. 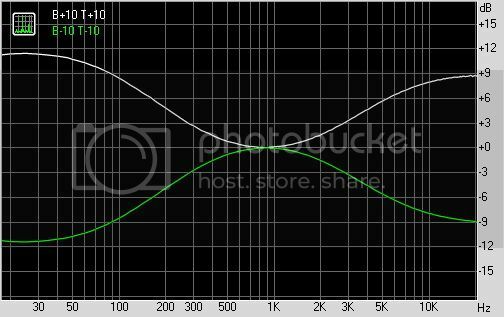 Since it is impossible to use SE530 on 12dB gain with volume 40/60, as it will be too loud, hiss really won’t be much of an issue. Any headphone that needs the 12dB of gain won’t be sensitive enough to pick up any hiss as well. EMI is an non-issue for E07K, which is dead silence even next to a ringing cellphone. With the use of Tenor TE7022 as USB receiver (like E17), E07K now supports 24/96 decoding over USB without any special driver. As far as real SQ goes, getting higher bit depth or sampling rate don’t actually improve SQ by much, but it is always good to know you have more than enough for future compatibility. Just be sure to set your PC right so it will enable 24/96 decoding as well. A tiny blue LED indicating power on. RMAA measurement doesn’t show any problem at all. 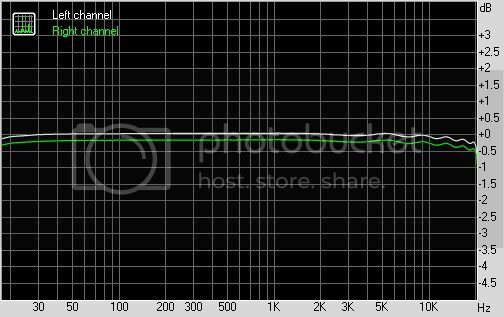 The DAC output is flat and so is the amp section. Beyond that, other parameters such as noise and THD are very well behaved as well. Crosstalk into a 16ohm load is around -61dB, which is respectable. Output impedance is an impressive 0.09ohm. Plenty of power into a 47ohm fixed load and even better to a 23.5ohm fixed load, showing it should drive low impedance load just fine. 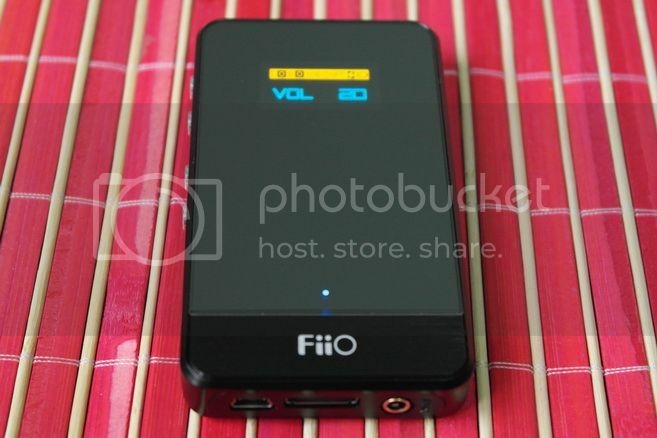 It also output slightly higher power than E17, which confirms the spec FiiO has listed. 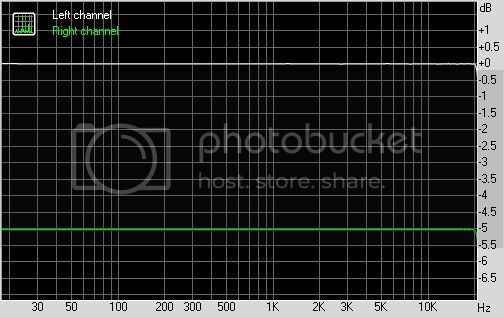 Frequency Response of E07K with USB DAC driving a 16ohm load. Unfortunately my E7 has bitten the dust due to battery issue (my fault for not charging it regularly), so I can’t compare E07K to E7. But my E6, which I consider to be a class better than E7, is still alive and kicking, so that will be what I’ll compare E07K, as well as iBasso D-ZERO in objective listening. As far as circuit design is concerned, E6 and E07K actually share a common root. The basic topology is similar between the two, but E07K uses MX97220 instead of the TPA6130 as its main opamp. While MX97220 is a big step-up power wise, it is a small step-up SQ wise. 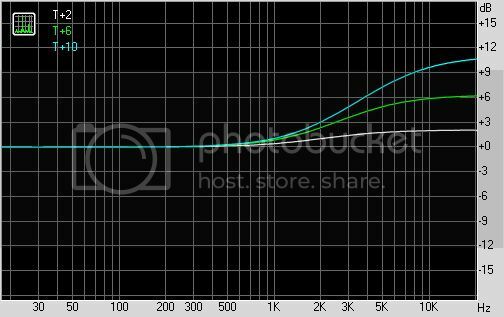 The biggest difference is that E07K is noticeably richer and warmer in tone, even though the FR curve is just as flat as E6. While it handles layer and depth better than E6 and give just a tab more texture, the richer tone gets into the way of sounding transparent. D-ZERO is intended by iBasso to be E7 killer – and for most part it is. The only issue is the $125 D-ZERO is a bit too pricy to compete on the $89 E7’s level, and probably less when competing with E07K as it is still the same $89 with added features. 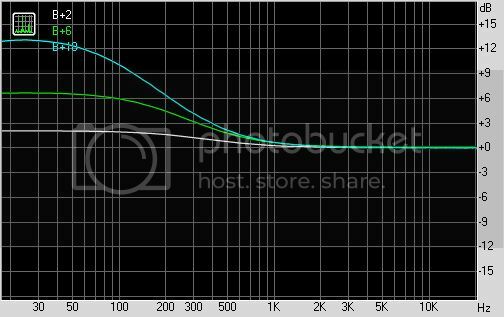 Both D-ZERO and E07K actually offer comparable sound quality where both acts only as DAC. Of course, D-ZERO doesn’t support 24/96 decoding while E07K does, but this doesn’t matter when the music is 16/44.1. Amp section however, D-ZERO is still a hair ahead of E07K. 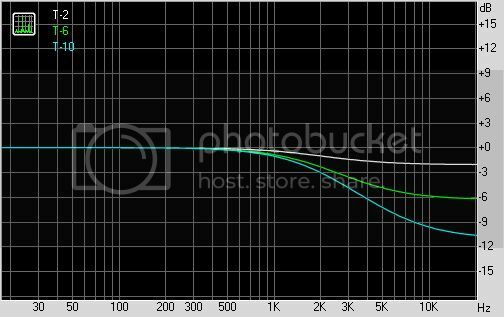 While E07K does offer excellent extension down to sub-bass (where D-ZERO has a roll-off), its warmer tone doesn’t give a very good rendering of space. This is where D-ZERO really excel over E07K. While the difference between D-ZERO and E07K isn’t nearly as big as D-ZERO over E7, it is still noticeable. 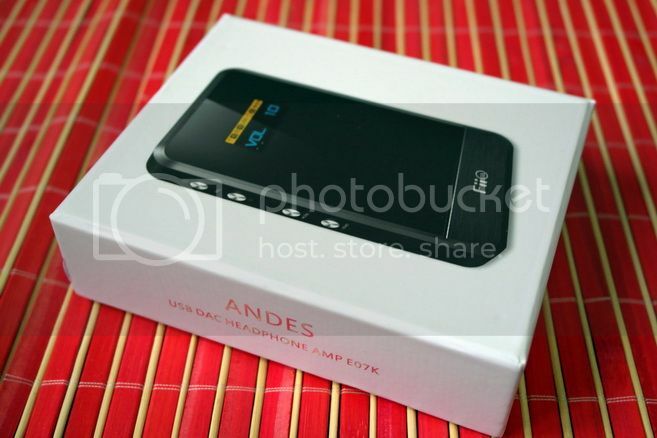 Overall, E07K is an improvement over the original E7 but still an entry level amp in SQ. The amp section is by far the biggest (and probably only) limiting factor. 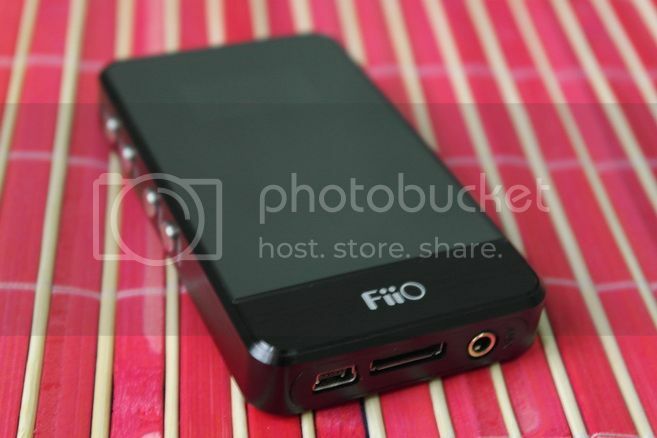 Without saying, E07K won’t be able to match the SQ of FiiO’s own E17 even though the two share many similarities. However, that should be quite evidenced by the fact that E17 is almost twice as expensive and offer even more features. Even though all the following RMAA results are freshly measured, for the most parts they do look like the same as E17. Not surprising since E07K’s EQ and volume control use the same design as E17, which include treble and bass EQ, as well as pan / channel balance control. Some of the treble EQ. Some of the bass EQ. Graph on the top: Pan control (channel balance) on one side. Graph on the bottom: How treble and bass EQ interact. E7 was once said to be E5 with an USB DAC. I guess in a way E07K can be said to be E6 with an USB DAC as well. 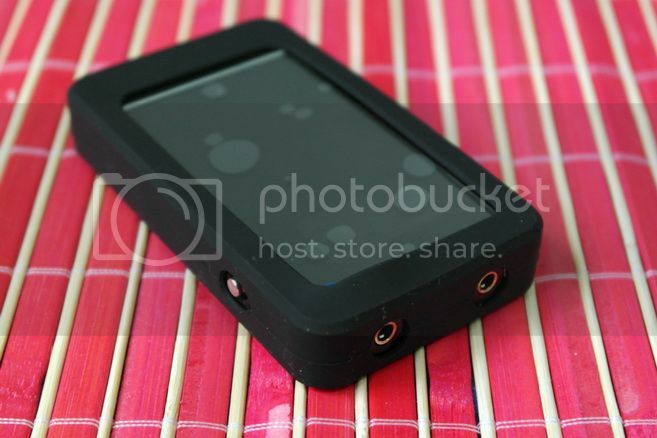 Even though the SQ has been improved and many features have been added, for the most part E07K is still an entry level portable amp / DAC much like E7. If you only want a good amp or DAC under $100, there are other options worth exploring. But for an all-in-one solution, E07K is probably the only one in town. Well, the only one in the sub-$100 price range anyway. A thanks to FiiO for the sample.